Happy Friday! This week I gave the Bloggers Challenge Players the following color challenge: Red, Teal and Curry. Of course I forgot that somewhere in the transition Red ends up blurry when posted on my blog. IRL the Red stamped panel is not blurry. I had something else in mind when I posted this challenge to the group, but of course when I sat down in my studio to create for the challenge, I ended up going in a different direction. I *love* the way this color combination looks, so I'm sure you'll be seeing it again soon! For this card, I used images from the Artistic Outpost Cracker Jack Plate. Stamping the image ala Warhol on the colored panels. 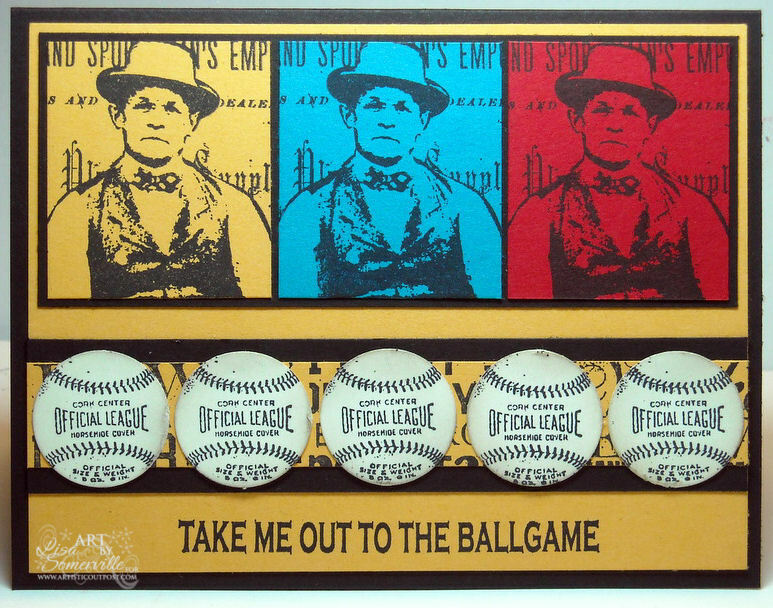 The baseball image is stamped in Black on Vanilla then punched using a 1" circle punch. Speaking of Warhol Cards, did you know it's the Try That Technique this week on the Technique Junkies Blog. You'll want to pop over there to see how you can get the 2005 Technique Junkie Newsletters at half price (plus shipping), this special is only good for 1 week though, so don't delay! Looking for more inspiration using this weeks colors, be sure to click on the Bloggers Challenge Logo on my sidebar to see what the other members created this week. This is so fun! I love the balls going across the bottom. Great card and great layout of these colors. I have not even started mine yet. Too lazy to get off my bum. Luv the color combo, to die for card! but the baseballs are da' BOMB! So many guys in my life would love this card!! Wonderful card...love the layout, too! Warhol is perfect for it! Great guy card!!! The colors are perfect for the Warhol technique! Great use of the Warhol technique with these colors. Love the baseballs across the card. I get so many ideas from seeing your art. This card is super fun--love those balls all the way across the front! I like the image too! I need to learn how to make more masculine cards--note to self:: ask Lisa;) YOU ROCK! Fantabulous card!! 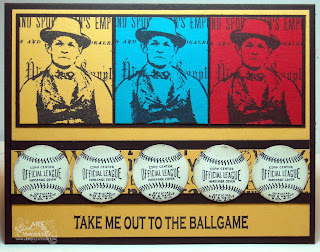 The colors look wonderful on your card and I like this guy and the baseball, very cool! Hi Lisa...the Warhol technique, (literally) plays well with this image and these colors. Beautifully presented. Great card. Hugs, Gayle. Well you "hit this one out of the park!" - It's awesome. Love the images and they really do go great with those bright colors and the Warhol technique. If you didn't have this in mind when you issued the challenge, I can't imagine it -- this is a perfect card for this challenge. Awesome! I ended up loving this color scheme too! It's perfect for Warhol and your baseball images look great with these colors! Great card! Love the subject matter you used for this card! This card just reminds me of my son! The Warhol effect really works with this color combo. And...you know how much I love baseball! Excellent Warhol design. Perfect for this color challenge! Beautiful job my friend! What a fabulous card Lisa! OOOH...I love baseball and I love your card! This is a great color combo and I love the warhol tech for it! Super cute! I love the Warhol look to the card! A great male card! The Warhol technique is perfect for this color combo....LOVE the baseballs. Great vintage card...with a modern twist! Great masculine card, Lisa! These colors were fun to work with. I do agree with you now that I have played witht his color combo that I do like it!! Would love to see it again soon!! Great card too!! I love those images!! I love this and I have that set so I just might have to copy you! Nicely done!